Demand is high — and on the rise — for many jobs in the health care industry. The Affordable Care Act has greatly increased the number of Americans with health insurance, which has in turn increased the number of people seeking health care nationwide. This combined with an aging population is combining to make health care jobs some of the fastest growing in the U.S. According to the Bureau of Labor Statistics, total employment in the health care industry is expected to increase by more than 15 million jobs by 2022. Check out these five health care jobs and their expected growth rates by 2022, according to the BLS. As baby boomers age, they tend to want to stay in their homes as long as possible, says Portland, Oregon-based career counselor Vicki Lind. That’s fueling demand for nursing assistants and personal health aides. help them with personal tasks such as bathing or getting dressed, says Peter Tourian, CEO of SYNERGY HomeCare. Nurses who work in home care may help with medication dosages and other medical tasks as well. Occupational therapy helps people of all ages resume their regular daily activities after an injury or being diagnosed with a physical, mental or psychosocial disorder, says Razan Hamed, associate professor and department chair of occupational therapy at the New York Institute of Technology School of Health Professions in Old Westbury, New York. People in these positions assess patients' abilities to perform daily activities such as eating, dressing, and moving around, and help them establish therapeutic goals to regain maximum functional independence. “As a long time teacher and practitioner in occupational therapy, I love the diversity of population we work with, the client-centered approach we follow, and the sense of creativity we have in tackling functional limitations," Hamed says. 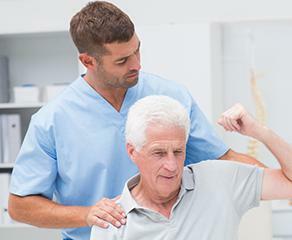 Physical therapists also work in rehabilitation settings, helping patients regain strength and function and manage pain after injuries or surgeries. One of the most appealing parts of the job is its flexibility, says physical therapist Lisa Frangione. She’s worked in several practice settings over the years, including hospitals, home health, care agencies and schools. She currently works in a public school and has the same hours as her children. Kristen Martinez is a therapist in private practice at Pacific NorthWell in Seattle. She specializes in LGBT+ issues and women's issues, and says therapists need to feel empathy, but must also avoid over-identifying with clients and crossing boundaries.